Jay Hernandez has experienced a pronounced change in his fashion sense recently. 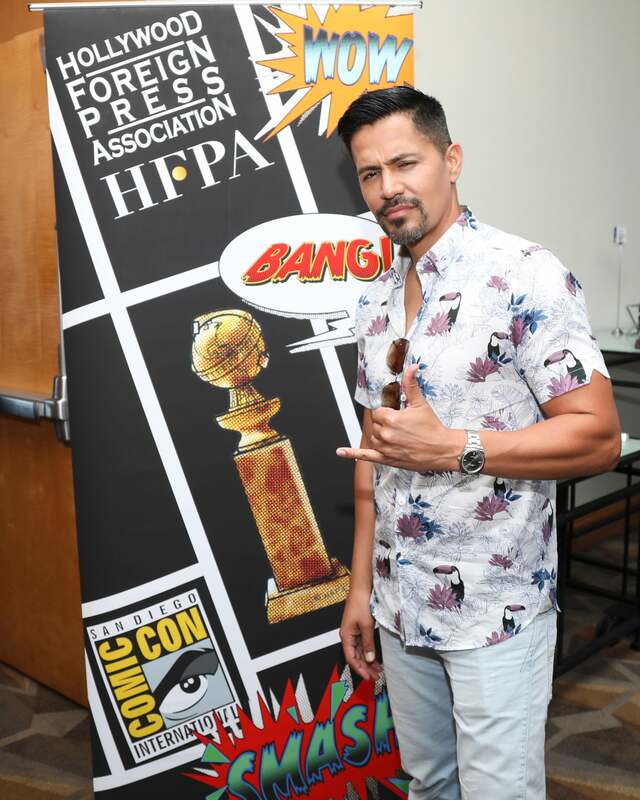 “My closet is basically all black (clothes), but when you get on an island it doesn’t feel right,” he told us with a laugh when he stopped by the HFPA Comic-Con lounge. “So I’m now wearing pink for the first time — salmon-colored cargo shorts, and flip-flops all day.” It’s not a mid-life crisis for the 40-year-old actor, however, but rather part of a professional obligation. Hernandez is at the center of the new Magnum P.I., a reboot of the hit series of the same name which ran from 1980 to 1988, and starred Tom Selleck as the rakishly charming title character, a private investigator living in Hawaii. Small screen reboots and re-imaginings of popular action/crime dramas are something of a trend; in addition to Lethal Weapon, which recently underwent a casting change in advance of its third season, there’s the upcoming L.A.’s Finest, which finds Gabrielle Union reprising a character she first played in 2003’s Bad Boys II. Threading that needle between those who might tune in out of nostalgic curiosity versus those looking for something fresh and new is important. Hernandez hints at cameos from original cast members (“I’m not necessarily saying it’s Tom, but there are some things working in the background that we’re all pretty excited about,” he says), but also plenty of differentiation. “We took what worked from the original show, and aimed to capture some of that same spirit, (but also) repurpose it,” he says. Hernandez certainly isn’t blind to the challenges of tackling an iconic character. “I saw it firsthand when I did Suicide Squad, with Jared Leto and the Joker, where you have a lengthy history of a character being portrayed (by other actors),” he says. “Stepping into those shoes is dangerous territory, no matter who you are.” He’s confident, however, that devoted fans of the original series — a group that includes his mother — will be able to enjoy Magnum P.I. alongside new viewers.